Ahijah Goldsmith Hinshaw2,3,6,7 [Abijah Goldsmith Hinshaw8,9,10,11,12, Isaac G. Hinshaw13, Goldie Hinshaw1]. Although the Quaker record abstracts show his name as "Abijah", he has always been known within the family as "Ahijah".4,6 This was probably due to an error in the abstracts8,9 - the original Quaker record books were handwritten and possibly hard to read, and it was probably easy to mistake a 'b' for an 'h'. Born Jun 20 18651,2,3,4,7,8,10,11,12 [about 186313], Holly Spring MM, North Carolina1,2,3,4,7,8,10,11,12. Hinshaw, Ahijah G., head-of-household, age 34, born June 1865 in North Carolina; parents born in North Carolina; married 8 years; occupation: farmer; owned farm (free). Hinshaw, Julia W., wife, age 31, born May 1869 in Indiana; parents born in North Carolina; married 8 years; 2 children, 2 living. 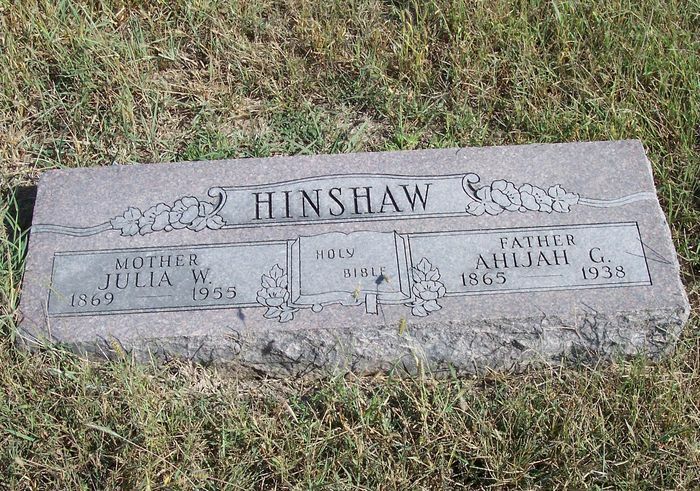 Hinshaw, Velma A., daughter, age 6, born June 1893 in Kansas; father born in North Carolina; mother born in Indiana. Hinshaw, Kelsey E., son, age 6 months, born Dec 1899 in Kansas; father born in North Carolina; mother born in Indiana. Hinshaw, Ahijah G., head-of-household, age 44, born in North Carolina; parents born in North Carolina; first marriage, married 18 years; occupation: farmer, general farm; owned farm (free). Hinshaw, Julia W., wife, age 40, born in Indiana; parents born in North Carolina; first marriage, married 18 years; 5 children, 5 living. Hinshaw, Velma A., daughter, age 16, born in Kansas; father born in North Carolina; mother born in Indiana; attended school. Hinshaw, Kelsey E., son, age 10, born in Kansas; father born in North Carolina; mother born in Indiana; attended school. Hinshaw, Freda, daughter, age 8, born in Kansas; father born in North Carolina; mother born in Indiana; attended school. Hinshaw, Curtis J., son, age 6, born in Kansas; father born in North Carolina; mother born in Indiana; attended school. Hinshaw, Howard P., son, age 8 months, born in Kansas; father born in North Carolina; mother born in Indiana. Hinshaw, Ahijah G., head-of-household, age 54, born in North Carolina; parents born in North Carolina; owned home; occupation: farmer, home farm. Hinshaw, Julia W., wife, age 50, born in Indiana; parents born in North Carolina. Hinshaw, Kelsey E., son, age 20, born in Kansas; father born in North Carolina; mother born in Indiana; attended school; occupation: farm laborer, home farm. Hinshaw, Freda, daughter, age 18, born in Kansas; father born in North Carolina; mother born in Indiana; attended school. Hinshaw, Curtis J., son, age 16, born in Kansas; father born in North Carolina; mother born in Indiana; attended school; occupation: farm laborer, home farm. Hinshaw, Howard P., son, age 10, born in Kansas; father born in North Carolina; mother born in Indiana; attended school. Hinshaw, Ahijah, head-of-household, age 64, born in North Carolina; parents born in North Carolina; first married at age 26; owned home; occupation: farmer, general farm. Hinshaw, Julia W., wife, age 60, born in Indiana; parents born in North Carolina; first married at age 22. Hinshaw, Freda, daughter, age 29, born in Kansas; father born in North Carolina; mother born in Indiana; single; occupation: music teacher, piano in home. Hinshaw, Howard P., son, age 20, born in Kansas; father born in North Carolina; mother born in Indiana; single; occupation: farmer, general farm. Hinshaw, Howard, head-of-household, age 30, born in Kansas; completed 4 years of high school; on Apr 1 1935 was living in the same house; rented farm ($8/month rent); occupation: farmer, farm. Hinshaw, Dorothy, wife, age 30, born in Kansas; completed 3 years of college; on Apr 1 1935 was living in rural Butler County, Kansas. Hinshaw, Darrel D, son, age 2, born in Kansas. Hinshaw, Harlan J, son, age 7 months, born in Kansas. Hinshaw, Julia, mother, age 70, born in Indiana; completed 8th grade; on Apr 1 1935 was living in the same house; widow. Hinshaw, Freda, sister, age 39, born in Kansas; completed 4 years of college; on Apr 1 1935 was living in the same house; single. 1910 census, Pleasant Township, Butler County, Kansas; roll T624-433, ED 20, page 176A, line #34, dwelling #7, family #7. 1900 census, Richland Township, Butler County, Kansas; roll T623-473, ED 18, page 5A, line #3, dwelling #222, family #224. 1930 census, Pleasant Township, Butler County, Kansas; roll T626-695, ED 35, page 5A, line #41, dwelling #114, family #114. 1940 census, Pleasant Township, Butler County, Kansas; roll T627-1222, ED 8-36, page 4A, line #12, household #69. Contribution from Kenneth Harlan Hinshaw. "Abstracts of the Records of the Society of Friends in Indiana", Part 6, subtitled "Encyclopedia of American Quaker Genealogy, Volume VII", (a compendium of many of the records left by William Wade Hinshaw on his death), edited by Willard Heiss; GS929.3 H47 in a local library. 1870 census, Eagletown P.O., Washington Township, Hamilton County, Indiana; roll M593-319, page 199, line #13, dwelling #331, family #326. Posting Feb 19 2001 by "GHokeness" () to HINSHAW-L.
1900 census, Richland Township, Butler County, Kansas; roll T623-473, ED 18, page 5A, line #7, dwelling #223, family #225. Obituary of John Randolph Hinshaw. 1920 census, Pleasant Township, Butler County, Kansas; roll T625-524, ED 31, page 1B, line #54, dwelling #13, family #13. 1930 census, Pleasant Township, Butler County, Kansas; roll T626-695, ED 35, page 5A, line #45, dwelling #115, family #115. 1930 census, Pleasant Township, Butler County, Kansas; roll T626-695, ED 35, page 5A, line #33, dwelling #112, family #112.